If the spleen only went one way this sort of thing would be vindictive, even nasty, but Castle is too self-aware a critic to carry out anything so brutish as a hatchet job. She persistently casts herself in ridiculous, demeaning roles (“I, her forty-something slave girl from San Francisco”), yelping at one point: “Caveat lector: Lilliputian on the rampage!” The self-belittling reaches its apotheosis in the most substantial essay here, “The Professor”, an extraordinarily gleeful account of Castle’s damaging relationship with a much older woman when she was a grad student in the midwest. Castle partakes of the culture’s sense of entitled contempt of the “English professor,” while also complicating that entitlement. Her essays turn her painfully won capacity to see herself and the world “mock-heroically” into a source of bracing truth-telling that, in turn, becomes an unexpected source of insight into the power of literature, art, and music in shaping a life. . . .
Castle learned mock-heroism the hard way—above all, as the title essay recounts, by surviving a humiliating, scalding, passionate affair as a graduate student with a self-intoxicated, regal, promiscuous female professor—a “connoisseur, a sensualist, skilled in the arts of homosexual love,” a wounding eventually and partially healed by abundant reading in eighteenth-century satire. . . .
Getting dirtied and staying dirty encouraged Castle not only to take a “debunking attitude toward the self,” but also to become insouciant about seriousness and easy about “self-burlesque.” She can be absolutely hilarious. And this suppleness puts her on both sides of the public/academy conflict: she expresses the general public’s contempt for the academic literary intellectual and the genteel sense of superior refinement that the profession cultivates in its members. 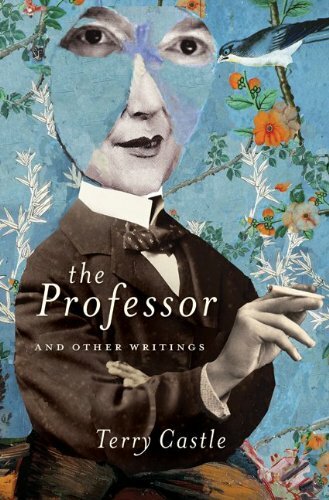 At MLA she bristles at a “drifting throng of rabbity academics”—an “unprepossessing” mass of “tweedy jackets, sensible shoes”—and also describes herself as an “effete little twit” full of “aristocratic disdain” not only toward her collegial brethren but particularly, in her youth, toward her earnest lesbian separatist sisters. understands more about the academic vocation, and the art of self-examination, than the shelf of grave and socially responsible studies of and by professors that have appeared in recent years. It is a superb weapon for tearing up that soul-destroying cardboard figure of fun its title names. Nothing in it that spoke to my own experience of “academic vocation,” and if Posnock’s last comment about “that soul-destroying cardboard figure” refers to the English professor as a general identity rather than a specific English professor such as the one with whom Castle had her awful love affair–if he means all of us, in other words, then I resent the implication and Castle should too, except that I don’t see where in The Professor she has done anything to show English professors as soul-enhancing. Both Batuman and Castle come across as supremely lovable dorks. As a grad student, Castle used to write some final papers during the first week of class, then brag about it to her classmates. (She seems less proud of this today.) Batuman once brought her bathroom scale to the library to weigh Tolstoy’s Collected Works, ten volumes at a time. (It weighs, apparently, as much as a newborn beluga whale.) Even their faults are lovably dorky. Here we go again with the anti-academic thing: why exactly is it such a “pleasure” to comically reduce the literary scholar, I wonder? Is it just a grown-up manifestation of the typical childish rebellion against teachers? A kind of erudite adolescent angst? What does it really have to do with anything that the woman who Castle became so disastrously involved with was a professor? Egan’s book is a terrific feat of ventriloquism, composed of 13 short stories that seesaw back and forth through time and interconnect multiple characters, particularly the lives of a music producer named Bennie and his assistant, Sasha. But it’s so much more than my lame synopsis—and more than a sum of diverse narrators and characters. The structure of Goon Squad reminds me in many ways of Joan Silber’s Ideas of Heaven, a lovely collection of six stories in which a minor character in one story becomes the narrator of the next. In Goon Squad, Egan focuses on multiplicity as well as totality; her approach isn’t about eliminating everything that’s irrelevant to a central narrative in the way so many novels are. It’s more about dropping a giant, rotating, mirror ball into a pair of lives and watching it turn. By the time I got through the book’s penultimate chapter, a breathtaking short story told entirely through PowerPoint slides, there were tears in my eyes. In the middle of Goon Squad’s fourth story, which involves a love triangle with a couple and their guide on a safari—a play on Hemingway’s “Short Happy Life of Francis Macomber”—I suddenly realized that I was reading a brilliant and wonderful book. The “goon” in the title, it turns out, is time—time that brutalizes, and ravages all things. Most of the recurring characters experience serious reversals and undulations of fortune—successes become spectacular failures and vice versa—in a way that somehow seems not artificial, but incredibly true. Egan makes you feel how time bends stories out of shape, gives them new, incongruous, beautiful, retrospectively inevitable endings. This is the kind of feeling you get from Proust or Tolstoy, but over hundreds, thousands of pages. I don’t think I’ve ever felt it from a short-story collection. “Virtuosity” is actually an apt word: You feel that Egan got so good at the form that she managed to get it to transcend itself—to make it historical, to make it do the work of the novel. It’s also very much “a book of our times,” a book of our historical moment. I’m thinking less of the story told entirely in PowerPoint than of the character who predicts the coming of Facebook: “The days of losing touch are almost gone,” he says. “We’re going to meet again in a different place. Everyone we’ve lost, we’ll find. Or they’ll find us. I picture it like Judgment Day. We’ll rise up out of our bodies and find each other again in spirit form.” Goon Squad shows how, in a certain sense, we can’t lose track of people anymore—even as, in another, older sense, we eventually lose everything and everyone. It’s a beautiful, valuable achievement. Calling Goon Squad a novel in stories, as it is sometimes billed, does it a disservice. The book is more like a scaffold. Each story is a platform connected by the structure Egan has erected, but, in the form of little bits of exposition within the stories, she also sends ladders shooting higher and ropes hanging lower, moving the characters decades into future where they may or may not meet again. The scaffold suggests the heft of a much larger design behind it. And, to extend this metaphor further, isn’t it true that an intricate, possibly hazardous scaffolding is sometimes more interesting to behold than the massive building to which it is affixed? That’s nicely put, a persuasive way to describe the book’s structure. My answer to his final rhetorical question, though, is “no”–or at least, not unless the building is a failure, in which case our interest in the scaffolding is partly that of a pathologist. What I really want is the edifice, not the artifice. So what to say about the Dear Lady herself, now that more than three decades have elapsed? True: one feels a bit like Sir Walter Scott putting the question so sententiously. One imagines a title: Dumped: Or, ‘Tis Thirty Years Since. Also true: that the matter evokes contradictory feelings in me. Having now described the fiasco with the Professor at length [she’s not kidding–the piece goes on for almost 200 pages], I confess, I feel on the one hand a bit embarrassed by its sheer triteness: my own sitting-duckness, my seducer’s casebook callousness. As I expected, revisiting Ye Olde Journals has indeed been lowering–not least because they tell such a dreary old-hat tale. Who hasn’t clawed at one’s pillow in anguish at a lover’s faithlessness? Had one jumped off a cliff that long-ago winter–Sappho of Lesbos-style–one would simply have ratified it: one’s lack of originality; one’s tedious by-the-bookness. What don’t I like? First, the Capital Letters. This is a trick Castle uses frequently in this volume when she wants to use terms she knows are trite and so decides to code as ironic: “Core Emotional Truth Time,” Still Too Much Going On,” “Trial of Taste,” “The Worst Song Ever Written,” “Wild and Fun and Oh-So Grown-Up.” It’s self-mockery, sure, but also a parade of intellectual superiority (“don’t worry, I know better than this“). Then the pronoun: why, in such an intimate tale, switch to the pompous “one” when the subject is clearly, as in every essay here, Castle herself? Again, it’s self-mockery, but the sententiousness is not any less because of the off-hand and unjustifiably condescending reference to Scott. (Scott’s version of Dumped would have been far less obsessively whiny and self-absorbed: think how foolish Our Hero Edward Waverley looks as he mopes about after Flora MacIvor!) Then the faux-apologies for the triteness of the tale told–faux, because she takes 200 pages to tell her side of the story, and while the visceral energy of the piece is undeniable, she’s right that it’s not, or is not made into, something extraordinary: there’s no broader implication, no lesson learned (for her or for us), no strong attribution of cause and effect between the miserable affair and her understanding of relationships or her development as a person or an intellectual. “Ye Olde Journals”? OK, we get it: you are keen to distance yourself from the woman you were when you wrote them. There’s no need to be so arch about it. And the Sappho allusion is the pretentious cherry on this dreary sundae of self-pity and vengefulness. Though I’m not nearly as interested in Terry Castle as I would have to be to find these nearly 200 pages truly compelling, I would at least have preferred that she write them with less effortful self-conscious posturing and more sincerity. Perhaps it’s the Victorianist in me confronting the 18th-century satirist in her, but there’s no sense that she got anything intellectually or morally out of either the experience or the narration of it. Fair enough, but then it’s hard to see what we can get out of reading this, except sordid voyeuristic excitement. To my surprise … [my mother] is an Agnes Martin aficionada. . . . My snob-self is frankly stunned at this unexpected display of maternal hip: it’s as if Wally and Charlie, my dachshunds, were suddenly to begin discussing Hans-Georg Gadamer. The flourishes of knowingness, the display of recondite expertise, the distancing irony, the snide self-mockery supplementing but never supplanting the self-absorption: the impression I get from this volume is that these qualities are not stages in Terry Castle’s life but define her personality. Judging from the effusive blurbage on the book, for people who like this sort of thing, this is really the sort of thing they like, but that turns out not to include me.